Saint of the day is St.Matilda of Denmark, born in 895. Daughter of Count Dietrich of Westphalia and Reinhild of Denmark, she was raised by her grandmother, abbess of the Eufurt. In 913, Matilda left the abbey, and married of King Henry the Fowler of Saxony, who had received an annulment from a previous marriage. Mother of Otto, Holy Roman Emperor; Henry the Quarrelsome, Duke of Bavaria; Saint Bruno, Archbishop of Cologne; Gerberga, wife of King Louis IV of France; Hedwig, mother of Hugh Capet. Betrayed by Otto after Henry the Fowler’s death when he falsely accused her of financial mismanagement. Founded several Benedictine abbeys. Well known throughout the realm for her generosity, she taught the ignorant, comforted the sick, and visited prisoners. 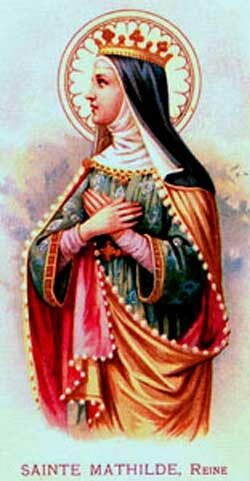 Saint Matilda died in 968.